Welcome to Night Vale, a small desert town in the American midwest where everything - paranormal activity, the wildest conspiracy theories - except normality is the way of life. Cloaked figures hang out at dog parks and make static noises; wheat products are banned having once morphed into deadly snakes; and the acknowledgement of angels is illegal. The town prisons and quarantine wards come equipped with the HBO channel; clocks run not only forward, but also backwards; and the locals insist that mountains are not real despite the town being hemmed in by peaks. Night Vale was born out of the very rich imaginations of Joseph Fink and Jeffrey Cranor, who have brought the town to life over 117 episodes (and counting) in a regular podcast since 2012. It Devours! is their second novel released in time for Halloween, following the eponymous Welcome To Night Vale (2015) that marked a successful shift in medium. Newcomers to the Night Vale series, who have never tried the invisible pie at the Moon-Lite Diner, will not be alienated so long as they can suspend belief and rationality. Unlike the regular podcast, which takes on the format of a radio programme and is voiced by local jock and bearer of bad news Cecil Palmer, it is his partner Carlos who takes a bigger role in this novel. 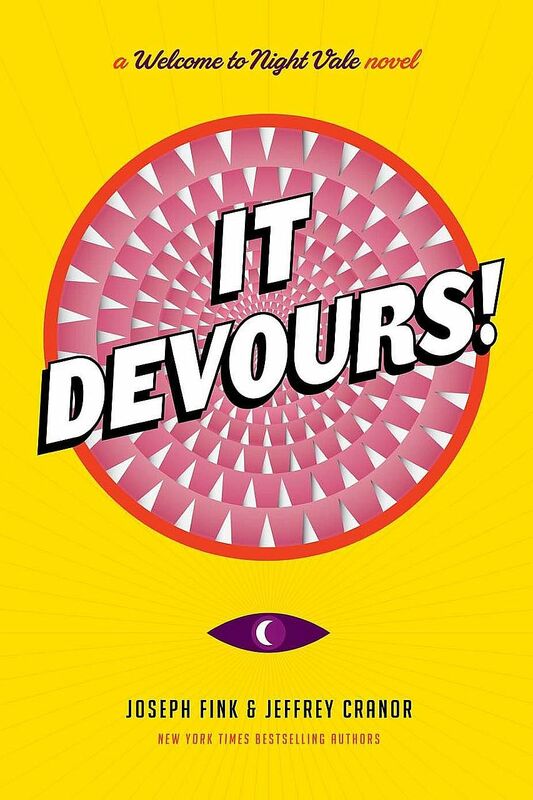 Look closer at the illustration on the cheerful kitschy yellow cover of It Devours! and you will notice rows and rows of razor-sharp teeth. The novel, which studies the complex relationship between faith and science in the usual off-kilter way, is centred on the overzealous Joyous Congregation of the Smiling God. The cult, which preaches that redemption comes when regrets, sins and unwanted desires get swallowed up whole by the Smiling God, is quickly suspected to be behind a recent spate of major seismic activity in Night Vale, creating massive sinkholes that devour buildings and the people within them. Carlos is a scientist whose experiments to probe the mysterious rumblings underground have repeatedly been thwarted, seemingly by shadowy government figures. At his wits' end, he enlists the help of his colleague Nilanjana Sikdar - a newcomer to town who gets greeted by natives with shouts of "Interloper!" - to study the House That Doesn't Exist. This is believed to be a portal to the desert underworld, where Carlos was once stuck for a year. Nilanjana quickly takes a qualitative investigative approach to the experiment - chatting up helicopter pilots overhead and forming a bond with the awkwardly charming Darryl Ramirez in her hunt for the "Wordsmith", whose warnings have terrorised the municipal government. Some ardent fans of the series have complained about inconsistencies in this novel's storytelling with the regular podcast. But it remains a thorough joyride into the realms of cosmic, comedic surrealism - and attests to the power of Fink and Cranor's imagination to be able to keep alive such a tale for so long. If you like this, read: Welcome To Night Vale by Joseph Fink and Jeffrey Cranor (2017 reprint, Books Kinokuniya, $18.95). Those who cannot get enough of the authors' delightful, quirky humour will enjoy the first book, which was one of Washington Post's top fantasy reads for 2015. It is about a mysterious Man In The Tan Jacket who has been leaving behind slips of paper around town that read "King City". • Go to www.welcometonightvale.com to find out more about the series.